Bangalore / New Delhi / Mumbai: Mahindra and Mahindra Ltd (M&M), India’s largest maker of sport utility vehicles, acquired a controlling stake in Reva Electric Car Co., putting it in a position to take advantage of the rapid pace at which the electric vehicle market is expected to grow over the next decade as governments push for stricter emission norms globally. The company, which will buy out the promoters’ stake and make a Rs45 crore infusion of fresh equity, declined to disclose the total value of the transaction in which it will get a 55.2% stake in the Bangalore-based firm, which will be renamed Mahindra Reva Electric Vehicle Co. Ltd.
Surjit Arora, analyst at Prabhudas Lilladher, estimates the price for M&M’s stake at around Rs330 crore. “This is based on the assumption that Reva’s enterprise value is around Rs500 crore," he said. 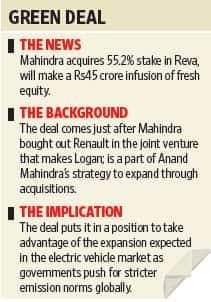 The deal comes just after M&M bought out Renault in a joint venture that makes and markets the Logan sedan, and is a part of chairman Anand Mahindra’s strategy to expand his $6.3 billion (around Rs30,000 crore) group through acquisitions. The company is betting on electric and hybrid vehicles, and expects alternative fuel technology to go mainstream in 5-10 years, said Pawan Goenka, president (automotive and farm equipment) of M&M, at a press conference in Bangalore on Wednesday. “We have a very strong focus on sustainable mobility," he said. “This (Reva) is the best technology available in the electric vehicle space." Mahantesh Sabarad, senior vice-president (equity research) at domestic brokerage Fortune Equity Brokers (India) Ltd, said the deal doesn’t have to be viewed from an “investment point of view", but as a move that helps in the acquisition of a capability. “It gives them a jump-start over the rest," he said. M&M has used acquisitions to strengthen its position in automobiles, tractors and information technology (IT). The purchase of Satyam Computer Services Ltd last year helped it increase the size of Tech Mahindra Ltd in IT services. The group entered the two-wheeler market with its acquisition of Pune-based Kinetic Motors Co. Ltd in July 2008, and it now sells 9,000 units a month. The 16-year-old Reva, founded by the Maini Group, has invested more than $50 million in developing electric vehicles, but has met with limited success due to high prices and lack of infrastructure such as charging stations. The company, which declined to disclose revenue, is yet to break even. Goenka of M&M said he did not expect to see profits right away and declined to say when he expected Mahindra Reva to break even. He aims to sell 50,000 units a year in seven-eight years and estimates the global electric vehicle market at 1.5-2 million units by 2020, with the domestic market to be at 80,000 vehicles by then. M&M has been working on alternative technologies for many years, having launched the electric three-wheeler Bijlee back in 1999 and sold over 50,000 units of the Scorpio micro-hybrid. But “Reva gives us three-four years of immediate advantage in terms of how quickly we can go forward", said Goenka. Reva has sold 3,500 cars since 2001 when it launched its two-door passenger car commercially. In September, it showcased two models—the Dilip Chhabria-designed, sporty, two-seater NXG and the automatic, four-seater NXR—at the Frankfurt auto show. It is also setting up a second plant on the outskirts of Bangalore with a capacity of 30,000 units a year, five times its present installed capacity. The Rs45 crore capital infusion will go towards the development of the two new models to be launched in 2011 and 2012, besides the new plant. “Financing is an important part if we want to continue in the leadership position," said Chetan Kumar Maini, deputy chairman and chief technology officer at Reva. Maini will continue to run operations at Mahindra Reva while Goenka becomes chairman of the reconstituted board. The Maini family will hold about 31%, AEC Llc 11% and employees 3% in the form of stock options. Earlier in the year, the Maini family bought out private equity investors Draper Fisher Jurvetson and Global Environment Fund, which had invested $20 million in Reva in 2006. M&M will increase the distribution network, provide vehicle finance and lower costs thanks to its greater sourcing clout, Maini said. Reva cars are only sold through showrooms in Bangalore and Delhi, while M&M has 70-75 dealers. While Reva sells in 24 countries in Europe and Asia, M&M has a strong presence in markets such as South Africa, Chile and Brazil. Reva’s strategic partnership with General Motors (GM) India for an electric version of the Spark is set to be scrapped. “We may not continue the Spark EV programme with Reva in the light of this development and will pursue our own electric vehicle programme," P. Balendran, vice-president at GM India, said in an emailed statement. M&M’s Goenka said GM was looking at other options. Bloomberg data indicated that only one of 41 analysts re-rated the M&M stock. Jatin Chawla, analyst at IIFL Ltd, said, “We are not re-rating the stock as it’s too small a deal considering Mahindra’s size." He will retain a “buy" rating. Some experts are sceptical about the prospects of electric vehicles in cutting emissions. A Boston Consulting Group study earlier this year said the introduction of such vehicles in countries such as India and China isn’t likely to bring down carbon dioxide levels. V.G. Ramakrishnan, senior director (automotive and transportation) at Frost and Sullivan, said M&M’s move reflects its intention to go beyond utility vehicles (UVs) and make further inroads in the passenger car segment, which is a much larger market. “While Anand Mahindra has always maintained that his firm intends to be steadfast on UVs, internally there seem to be a rethink on the strategy," Ramakrishnan said. M&M shares gained 0.64% to close at Rs519.45 on the Bombay Stock Exchange, while the exchange’s benchmark index, the Sensex, gained 2.28% to close at 16,387.84 points.